Oma discovered volunteer red peppers growing in the garden this morning. That made Oma think; are hot red peppers a fruit? The chili pepper is the fruit of plants from the genus Capsicum, members of the nightshade family. The substances that give chili peppers their intensity when ingested or applied topically are capsaicin (8-methyl-N-vanillyl-6-nonenamide) and several related chemicals, collectively called capsaicinoids. From the mild and sweet to the super spicy, peppers are seedy and thus categorized as fruit. 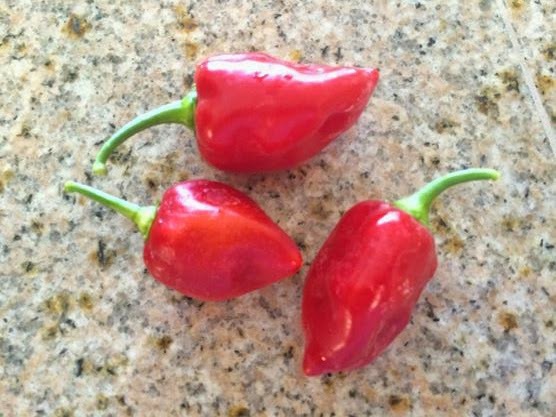 Red chilies contain large amounts of vitamin C and small amounts of carotene (provitamin A). 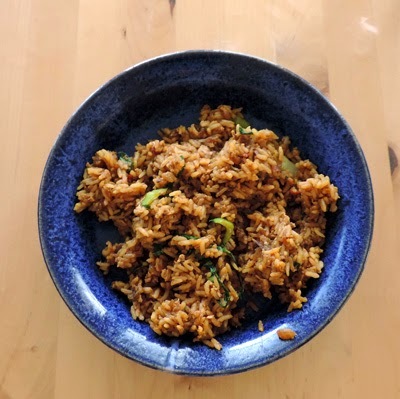 The pepper Oma and Opa put in their Nasi Goreng (Indonesian Fried Rice) tonight was very flavorful and very spicy hot. Oma believes it was a Habanero pepper. Interesting fact: Capsaicin extracted from chilis is used in pepper spray as an irritant, a form of less-lethal weapon. Labels: Different Fruit A Day Challenge, Health, Healthy Food, Oma Loves U!